I'm going to try to bring a little order to this 2 and a half year old site by posting certain themed articles on certain days. On Fridays, I plan to post slightly more involved recipes or food projects that are best tackled on the weekends. The first one is this really rather simple recipe for apricot preserves. It's easy to make but the preparation and cooking do take some time - a perfect project for a day off. Making jam and preserves may seem like an out of date thing to do. The idea of having a pot of boiling sugar and fruit simmering away in the kitchen on a swelteringly hot summer day may seem to be a rather masochistic and unnecessary ritual. If we need to preserve the bounties of a garden, there's always the cooler option of freezing. Besides, nowadays we can just buy delicious jams and preserves from a variety of sources. Still, I love to make sweet or savory little pots of preserves, pickles and liquors from fresh fruit and vegetables. It goes back to memories of my late oba-chan, my grandmother, making pickled umeboshi plums every summer (which I wrote about a few years ago); or my mother when we used to live in England making gooseberry preserves for the first time. Above all, each pot of jam or preserves seems to capture a little bit of the warm summer months in them, something that impersonal frozen bits of fruit and vegetable can't do. Last week on on our next to last day in Provence, we went to the amazing Marché Agricole (farmer's market) in Velleron, a small town near Carpentras. One of the purchases we loaded into our car for the trip back home was a 5 kilo (about 11 pounds) crate of "Class II" apricots. Now I must confess - I am not a big fan of fresh apricots. While they smell like heaven, to me their texture is inferior to that of their cousins, peaches and nectarines. Cooked apricots are another matter though. Once they are heated, the fruit turns golden, fruity and luscious. As soon as I spotted those large flats of smallish apricots, I was determined to turn them into preserves. Another advantage of making your own preserves is that you can control the amount of sugar in them to some extent, and that's what I did. These preserves are just a bit less sweet than commercial varieties, and are also a bit chunky in texture. I love it on plain yogurt or vanilla ice cream, though it's also terrific on a thick slice of fresh buttered bread. I've scaled down the recipe to a manageable quantity - just scale it up for larger amounts. If you don't want to go through the bother of properly sterilizing the jars and lids, you can store this in an airtight container in the refrigerator for a month or so, or in the freezer for longer. Optionally, crack open a few of the pits ([edit:] just a few, no more than a small handful! see the comments) with a nutcracker or hammer (wrap them in a cloth and smash! ), wrap them in some cheesecloth and put in the pot. This imparts an intriguing almond flavor to the preserves. I always use canning jars with replaceable lids with the rubber seal built into the jar. They are very easy to handle. I re-use the jars, and replace the lids for each fresh batch of jam, preserves or chutney. The low oven method: Put the washed jars and lids into an oven heated to about 110°C/230°F. "Bake" the jars for about 20 minutes, or until the water on them is totally dried out. Take them out carefully using tongs and/or a clean oven mitt. This is the method I use. When you are handling the sterilized jars and lids, at no point should you touch the jars inside or on the rims, or inside the lids. Your hands are not sterile even if you wash them well, unless you scrubbed up like a surgeon. If you want the preserved to have that jellified state that commercial jams have, use either sugar for preserves or add pectin powder. I don't bother with this for these preserves. If they are a little runny don't worry, they will still taste terrific. Submitted by maki on 2006-06-23 21:22.
she left it in when she sealed the jars. And like you said, it all depends on the amount. There was never a lot, but just enough that it was her little "secret" to great jam. at the jars of Gold necter. This brings back many memories, as my mother never wrote down her recipes. Thank you! I can't wait to try this out. Kevin: Actually, it is not that bad. It is indeed true that one of the amygladin metabolism products is HCN. However, it is in small dosage, which the human body can convert to a less problematic substance. Also keep in mind that you don't eat the apricot kernels in the jam, as they are kept in a separate bag, and removed before putting the jam into a jar. Also, a major part of that small amount of HCN being released into the jar evaporates during the cooking. So, it is best to follow the words by the most famous Swiss medicus, Paracelsus, who said "it all depends on the quantity". Kevin, great point. I want to emphasize that you only want a small quantity of the kernels. Apricot jam has been made with a small amount of kernels to flavor it for hundreds of years I believe, and in small quantities it should be ok. But of course, if it concerns anyone, just leave it out - the preserves will still be delicious! IF ANY ONE STUDIED THE DATA BY PROFESSOR SAGURA AT THE SLONE KETTERING UNIVERSITY BACK IN THE SEVENTIES YOU WOULD REALISE THAT APRICOT KERNEL IN ANY QUANTITIES ARE VERY BENEFICIAL AND ARE NOT HARMFUL IN ANYWAY! THE CHEMISTRY OF ITS METABOLISM IS QUITE SIMPLE AND OFTEN MISUNDERSTOOD! JUST ASK ANY 120 YEAR OLD HUNZA IF THEY ARE FEELING THE EFFECTS OF EATING TOO MANY AP'S??? DON'T THINK SO! I made the apricot jam and it is delicious! I wanted to know if the same recipe would work for plums? I probably don't need the lemon juice because plums are more tart than apricots. Please let me know, my plums are almost ready to pick! It should work quite well for plums. Depending on the kind of plum, it will have a higher pectin content (the thing that makes jam jell) than apricots so it should be more jellified, which isn't a bad thing at all. If the plums are quite tart you may want to add a bit more sugar, but it's up to your taste of course! oh, by the way, I wouldn't crack the plums for plum jam. Thanks Maki for your answer regarding plum jam. I have another question about plums. Are the plums used to make umeboshi the same as plums used to make jam? Do you have a recipe for umeboshi? I live in Idaho and they don't sell it here and I'd love to make my own. I think shiso leaves are needed, and I probably can't get them. I've never really seen red shiso being sold in the U.S. either, though shiso (perilla) is quite easy to grow and a lot of seed catalogs carry it now. could i use canned apricots? I have tons and a few new recipes i want to try call for apricot preserves. I know fresh is best but its winter here in MI. Just a thought. I have made apricot jam VERY successfully from canned apricots which I boiled up in a large glass dish in my microwave. It jelled and set perfectly and can't be distinguished from the usual fresh variety that I make except that there are no cracked pits to add that lovely bitter flavour. Dried apricots soaked overnight in water (and then drained) with their weight in sugar also make great jam in a microwave - oops I mean preserves or 'jelly' as americans call jam. As its just coming in to summer in Japan all the green ume are for sale for umeboshi and umeshu. I picked up a some ripening ones and let them go ripe, so they look just like apricots. Then I made your jam with them. They aren't sweet like apricots and bring an amazing sour flavour to the sweetness. Almost like a marmalade. I have done alot of home canning, using both the method you talk about here and hot water bath canning. In order for a vaccuum seal to form with the method you talk of here it is necessary to fill the jars leaving a half inch space between the preserves and the top. If they are filled to the rim, you risk contamination by leakage through the seal. Even if refrigerated using these directions, contamination is possible. It is also a good idea to wipe the rim of the jar after filling (I have used a damp paper towel with no problems) in order to ensure a good seal so a vaccuum will form. Can't wait to try this recipe. We have an apricot tree in the back yard of our new house the the picking has begun! Thanks for this post! I have an apricot tree in my backyard and have been wanting to make preserves for awhile now. I did a search on recipes and didn't find a lot surprisingly. Anyway, it was the project for the day. I picked 9 pounds of apricots! And ther are more at higher levels. I used the water-bath method, following instructions from Canning for Dummies and your recipe. Can't wait to taste it. I have a plum tree too. I might be doing a repeat soon. Thanks again! 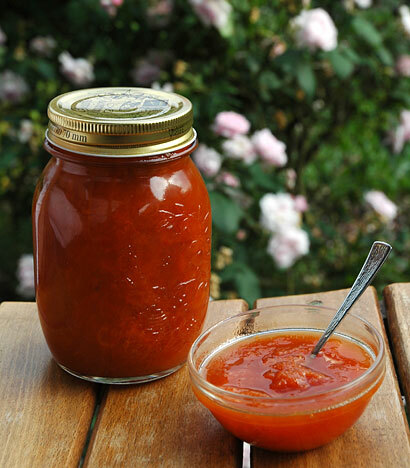 I have an apricot tree and for ages I have wanted to make preserves with the apricots and have often found myself a little afraid of the recipes I have found. This worked beautifully and was the perfect way to use overly ripe apricots. Now I have lovely jars full of sunshine. thanks for posting this tasty and simple recipe. I used 7.5 pounds of cost-co qpricots -- not the greatest, but they were cheap and the jam came out delicious. I used less sugar (4 cups), and like the tart sweetness. added lemon is a great touch. i just found your site and really like it. tomorrow, plums! By the way, my granma taught me to throw one of the apricot kernels in each jar just before sealing, to add to the flavor. Apricots grow quite well in Albuquerque and a neighbor recently shared about 6 lbs of his bounty. I canned 5 lbs today using your recipe and instructions. Everything turned out divinely. What about putting Pineapple in with the appricots? Is it fine using alcohol for sterylising the jars? Hello, I just have this question in mind in regard of doing more friendly the sterylizing process. 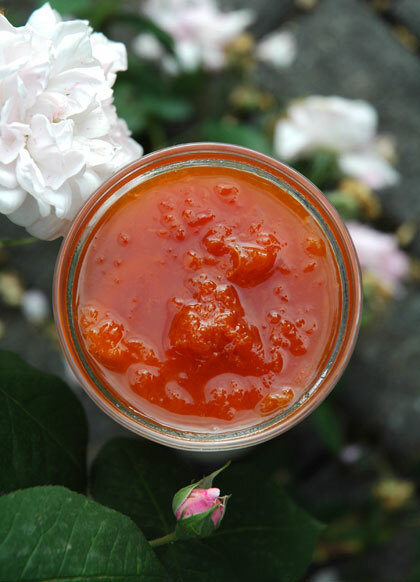 The picture of your jam looks awesome, similar to the Harvest Song apricot jam which I just love to eat with yogurt! I never thought of making apricot jam, but your instructions look so simple that next time apricots are in season I will give it a try. Well I made the jam today! I had the neighborhood kids pick and split the apricots. Some were still a little green but after cooking them down the house smelt yummy and sweet. Hi....just wanted to tell you how much I enjoyed making your recipe for apricot preserves. The jars are still cooling and I am listening for the "popping". The taste is amazing and so fresh. I was wondering if I can use the same recipe using Ontario peaches which are now ready. Can I add some almond extract to adjust and enhance the flavour. Thank you for your help! wondering if I can forgo the jars with lids and use sterilized jelly jars with melted paraffin poured over tops to seal? (this was how my family often finished their jams and jellies). any advice welcome! I ahave a bag of fresh apricots in the fridge I am dying to make preserves out of! thanks in advance. Sealing jam jars with paraffin wax is no longer advised for jam-making as the seal does not adequately protect against bacterial contamination. any comment on use of the skins?? the recipe just said to seperate the apricots. should they be peeled........ or not....... or what ?? 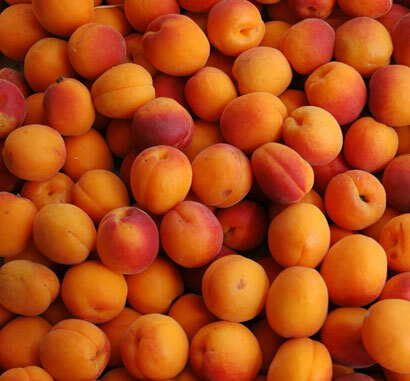 Apricots have very thin skins, so they don't need to be peeled. I just think your recipe is genius. The flavor is out of this world. I added my own variations to make other flavors. To the base recipe to "make it my own" I added one vanilla bean, seeds scraped and added. SO GOOD. I also made a spicy version with crushed red pepper, a brown sugar bourbon version and one with cinnamon! You have imparted a lovely gift on me - I have an apricot tree in the front yard of our new house and because of your recipe you got me excited for every year it produces fruit! I plan on passing down this recipe to my kids! Thanks! I made this last June, and we all loved it. This will be an annual thing for my family now. Thanks for your delightful and delicious recipe! I just enjoyed some of these apricot preserves with breakfast. This was my first time canning or making preserves, and your recipe and explanation made it easy and delicious! Thank you! I have never added pineapple to apricot preserves, but I would be inclined to add some fresh pineapple, not canned, since canned is already cooked and soft in texture. Maybe try chopping some up and adding it with about 30 minutes to go for the apricots, to add texture. Denver, otherwise known as the mile high city. But the weather was kind this year, even though there were a few touch and go days. a day. Don't ask why. through several web-sites until I found this one. Christmas presents. I just sent several pounds of fresh apricots to my mother in NYC, boy was she surprised and delighted. I will be adding some kernals to my recipe. I made this jam last week with a friend with 2+ lbs. of fresh apricots she got at the Portland Farmers Market. In the last three minutes or so we added a sprig of lavander just for fun. It is absolutely wonderful! The apricots were almost ripe and we added a little extra lemon juice. It is really good on toasted whole wheat bread! Wow, I was so happy to find your page. Santa Fe NM seems to be overflowing with apricots at this time of year but they all sadly go to waste as people don't care to eat them. Thankfully, apricots somehow manage the frost here, which is surprising as we are 7,000 ft above sea level (making us the highest capital city in the U.S.) which painfully kills off many other fruits in the city. Anyhow, Thank you so much for the recipe, it was delicious! All I can say is, "Wow!" (and thank you for a great recipe). I had a box of overripe apricots and was worried they would rot if we didn't eat them, but the kids didn't like their mealy texture so they seemed doomed for the dumpster until I thought about making preserves with them. I have never made preserves but your recipe was easily written and seemed simple enough. It turned those blah tasting apricots into superstars! The preserves were so good and while they started a mellow yellow color, at the end they were that dark, beautiful orange color and tasted like fancy, expensive preserves! Thanks again! New to canning and perserves. I love apricots and wanted to make a jam and i plan to try this recipe today. A few questions..
1. How long will it keep in the jar if its not open? 2. Can i use it for baking? Pie filling, cookies, yummies? I forgot to add the lemon juice. Will the preserves still be ok.? Just want to be clear, as I've never made preserves before: if I put the jam into sterilized jars, I don't need to process it in a water bath? And I have jars that I didn't use to make jam in, but stored things in--do I have to buy new lids? Thanks! Have lots of apricots, but don't want to poison anyone! Just wanted to reply to this from anon, though it may be too late. To store jams on the shelf, you need BOTH sterilized jars and then to process in a water bath. Basically, you need the jars to start clean, and then once the lids are on, you need the boiling water bath to be sure everything inside with the jam is completely clean. When I don't feel like doing the water bath, I just keep my jam jars in the freezer. I haven't had any trouble keeping things for at least a year in the freezer. And if you want the jars to seal properly for shelf storage, I would use new lids. For the freezer, it doesn't matter. For canning, I've found Eugenia Bone's book Well-Preserved to be a great resource; the Ball Blue Book is also a detailed classic. Online, there is wonderful, clear, science-based food safety information for all kinds of preserving at the Nat'l Center for Home Food Preservation at http://nchfp.uga.edu/. Good luck! I'm making the apricot jam myself tonight. I just wish I could get the abundance of them that others report! They are not common here! The USDA says to process for 20-25 minutes, longer for bigger jars. We just want to be safe. Going to try your recipe tonight. Thanks. Bravo this is an excellent recipe and very easy. I reduce the sugar to one cup per kilo apricots and its still sweet. However, i would like to add that apricot kernels have been discovered to be an excellent anti-oxidant and they are now proven anti-cancer. Cancer is unknown to the Hun tribe who treasure eating the kernels. They do give a nice nutty flavour - i have been making this preserve with different varieties of apricots and have dried the stones in order to remove the kernels - interesting is that the kernels of some varieties are sweet and from others they are similar to bitter almonds. however, as the ancient Greek philospher said " Everything in moderation is excellent". Hello! Would this recipe work alright for freezing? My boyfriend's mother wants me to make jam or preserves out of the enormous yield of apricots their tree had, but since she doesn't expect them to get used very quickly she wants to put the jam in plastic bags instead of in jars and frozen, which of course means I'd have to let it cool before bagging it. Would this be safe? Also, where are the aforementioned recipes that use alternative sweeteners, since she's diabetic and I need to avoid sugar? Hi Willow. For diabetics (since writing this article I have discovered I'm pre-diabetic myself) what I would do is make stewed apricots rather than aiming for a jam-like consistency. That just means you de-stone and cut up/rip apart ripe apricots as per the recipe, and then cook it down until it is a bit syrupy. Then sweeten the cooked apricots with any sweetener of your choice. It will not be jam consistency, but will still be great to mix with yogurt and things like that. Artificial sweeteners just don't work as sugar substitutes in jams and preserves, and if you cook the fruit way down so that it's concentrated, the sugars in the fruit will get concentrated too. You can freeze the stewed fruit in portions that you would use up within a few days, and transfer each portion as needed to your fridge before you need them. Hope that helps! I hate to sound stupid but you don't mention whether or not you need to take the skins off of the apricots first. Is this necessary or would you end up with chunkier product without taking off the skins? Hi Becky, I never bother to remove the skin of apricots since it's so thin. I just came across your website and I cannot wait to try this recipe. I have been making my own jellies and preserves for about a month (slightly obsessively) and I'm still learning but I find that most of the recipes I have tried come out far too sweet for me. 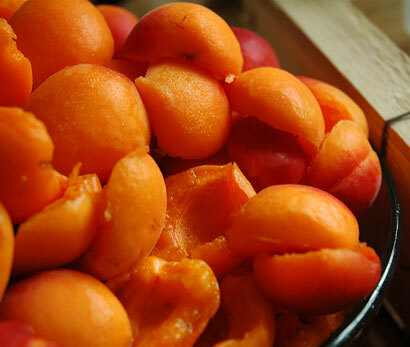 I love the tartness of apricots and I hope your recipe does not disappoint! I will be trying your strawberry jam recipe as well. I love this website and being French, I can relate to all your food experiences there (and I agree the strawberries in France are simply the best in the world). I've never made jam, let alone any other type of canning, so off to the Internet I went! I found your recipe and it came out perfectly! I did use a water bath to seal the jars (I'm at high altitude and wasn't sure the heat from the jam alone would be enough). The pits are becoming famous as cancer cell killers. Might want to save those apricot pits and crack them open later. Chew well and swallow! Tip for cracking the pits: use a pair of pliers with an adjustable joint. Open the jaws so that the handles fully close leaving a space between the jaws just a bit smaller than the apricot pits. I'm in the process of making these preserves as I type. I hope my apricots will be up to par because I cleaned and pitted my apricots a couple days ago and left them in the fridge because I ran out of time. For future reference, I'm curious, I have an overabundance of fruit so would you recommend doubling the recipe? Also, I've seen on other sights a candy thermometer was used. What's your opinion on this? Can't wait to try these yummy preserves. Great basic recipe. I did make a few alterations I'm quite happy about. The first is I substituted Stevia for most of the sugar, retaining only about 40% of the sugar this recipe called for and the flavor and texture was none the less for this. I also threw in a handful of sliced almonds. But best of all, I added 1/2 of a lemon's zest for each kilo of apricots--superb marriage of sweet and tart that produced the best jam I've ever made. Just finished a batch and had the bit left over for tasting. YUM! Thank you very much. Hope you are feeling well.